Resources for Instructors. These and many other of the Center's publications are available for free download (see links at left). Center members also publish in a variety of journals and other publications. Please see the Center Research Bibliography for details on research publications by Center members from 1994 to the present. rs, researchers, and others on the development of sustainable agriculture. 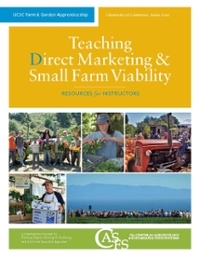 Read about Cultivating a Movement: An Oral History Series on Sustainable Agriculture and Organic Farming on California's Central Coast on the University Library's web site. For more information about publications, contact casfs@ucsc.edu or call 831.459-3240.